This mornings journey took us out of Cork, past Macroom and over the Derrynasaggart Mountains where Ireland’s highest pub the ‘Top of Coom’ is situated. 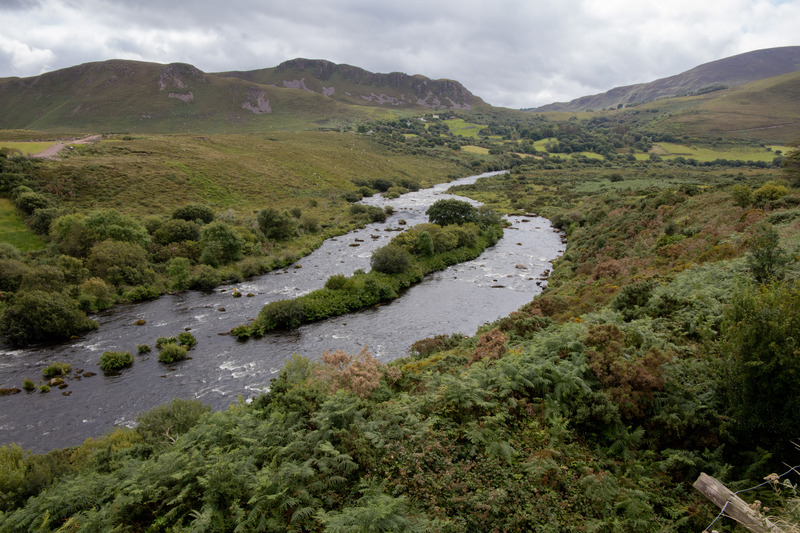 It is situated just over the border between Counties Cork and Kerry. The scenery around us reminded us very much of Scotland, especially the hills where I grew up. 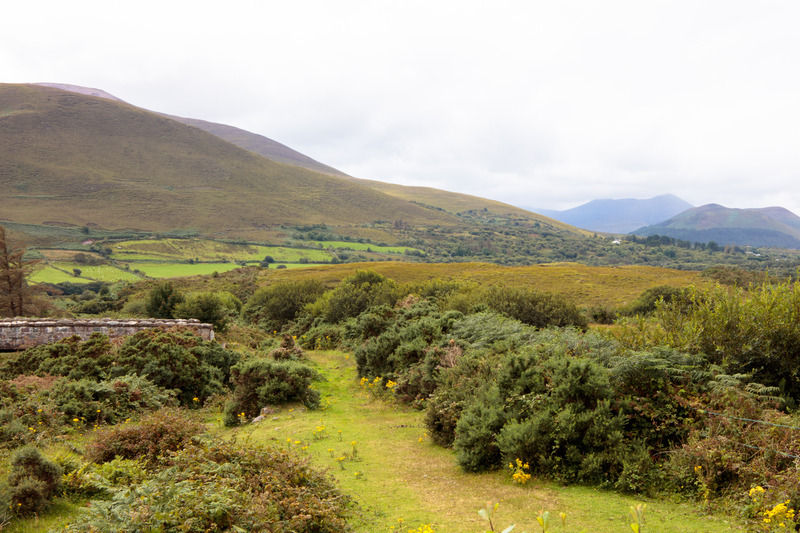 The road descends through Glen Fesk and on into Killarney which boasts Ireland’s only Lord of the Rings themed pub. We had a coffee and a brief wander around town before taking the turning for the Ring of Kerry. We only had a few hours to drive the road and there are many routes over the mountains and interesting ancient sites around which will have to be explored in a more leisurely fashion on another trip. 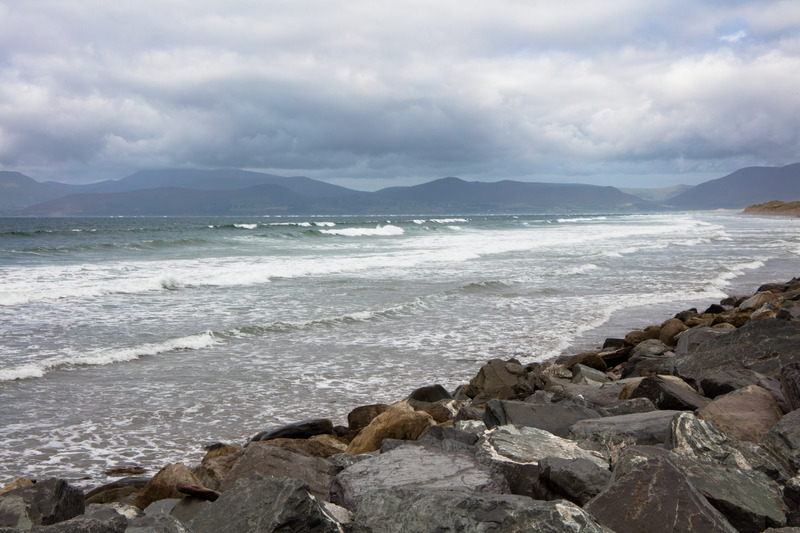 Our first stop was at the point at Rossbeigh where the tide was just about to start to recede on the rocky shore. 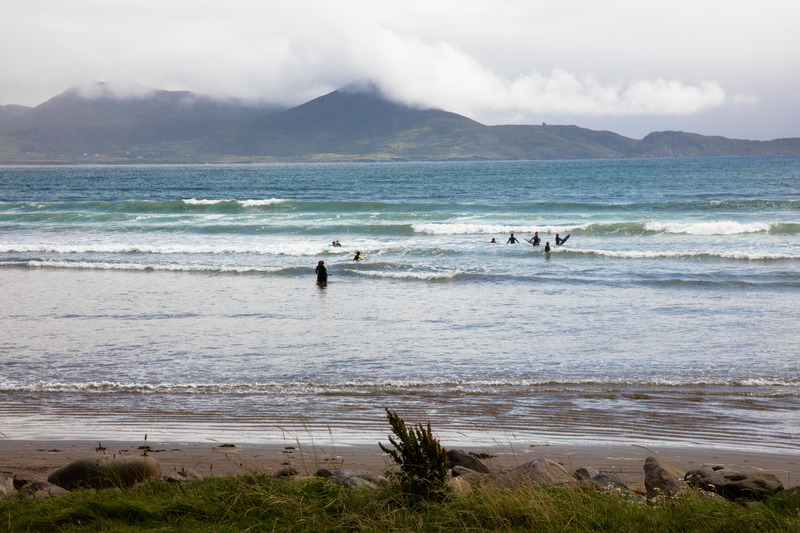 A couple of people were trying somewhat unsuccessfully to surf. There are sand dunes and a beach on the other side of the point and it is possible to explore it on horseback if you wish. We could see the Slieve Mountains across the water. 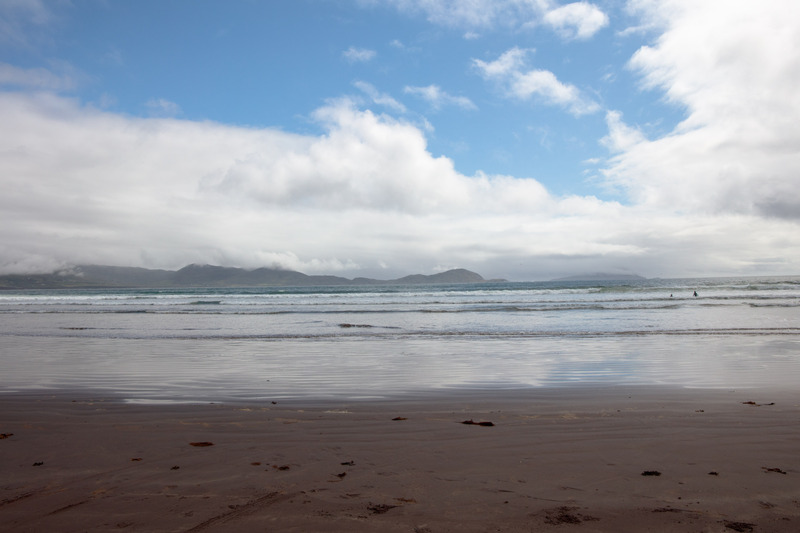 The next stop for a walk was Inny Strand on Ballinskellig Bay just before Waterville. This was a little busier with some people swimming. The water would not be warm enough to tempt me in. Parking here is limited but we managed to find a space and walked on the beach. 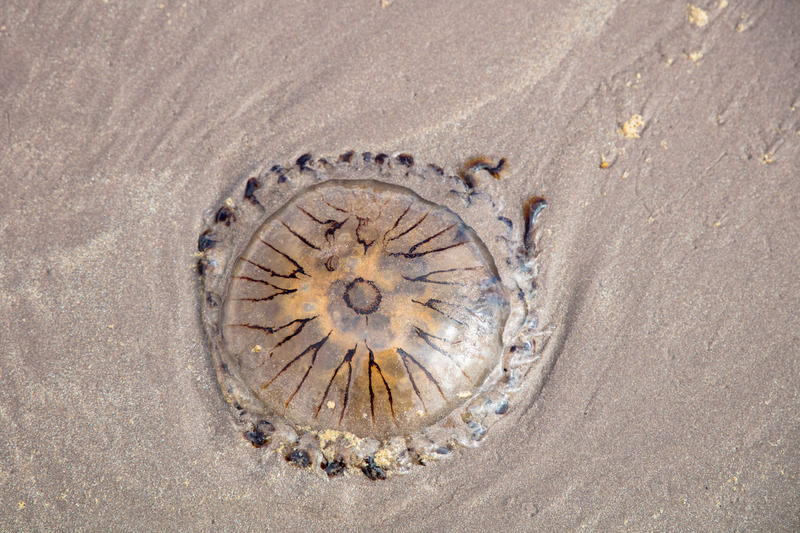 The tide had retreated more since we left our last walk and numerous jellyfish were stranded on the beach. On the edge of the bay was a derelict concrete building. After wondering what it was, we discovered that it had once been a hotel. We could not help thinking that if someone could invest in it, it could be resurrected in such a beautiful spot. Back on the road we kept stopping at various points to admire the view. 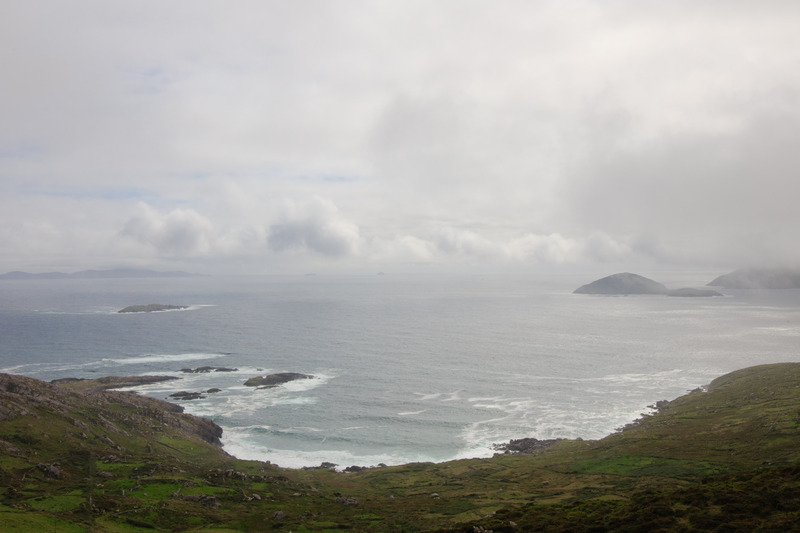 Near Castle Cove, the mist descended and began to hide the islands offshore. We had a brief spell of rain and passed several signs to standing stones (some people even seemed to have them in their garden) to explore in the future. Eventually we reached Kenmare, a small town filled with places to stay, eat and drink in addition to local services. 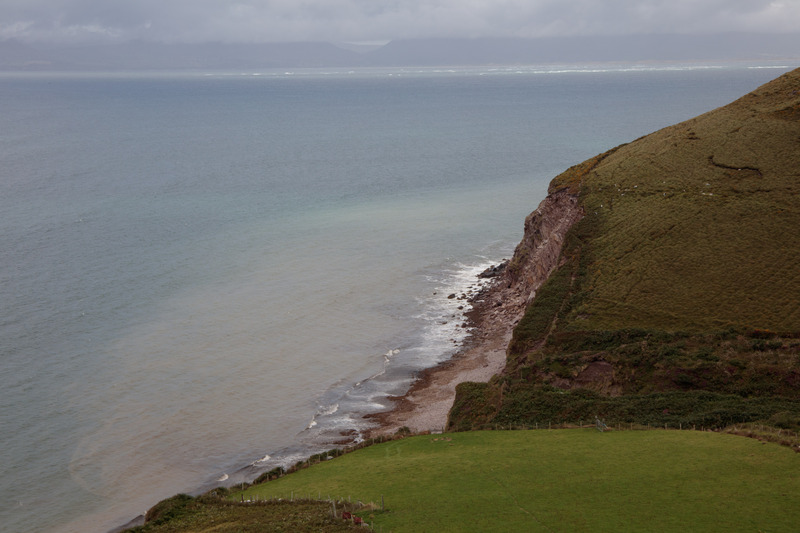 Its name means ‘head of the sea’ and it sits at the end of a bay. It is a good base for exploring the local area. After settling into our hotel we walked the short distance into town and after eating, found some traditional music in a local pub to finish off the night.